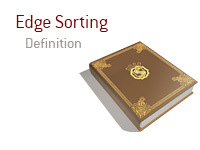 What is the definition of the term "edge sorting"? What is meant by the term "edge sorting"? You may have heard the term "edge sorting" when reading about the various lawsuits that Phil Ivey is currently involved in. In one case, Crockfords (the oldest casino in Britain) refused to pay out many millions of dollars to Ivey because they alleged that he was gaining an improper advantage by "edge sorting". In another case, Borgata sued Ivey for $9.6 million after alleging that he won many millions of dollars from them by utilizing "edge sorting". So, what exactly is "edge sorting"? In order to use "edge sorting", a player needs to be playing with cards that have been improperly cut. A normal card should have a perfectly symmetrical design on the back, while an improperly cut card will have an asymmetrical design. So, let's say that a player sees that the cards have been improperly cut. Let's say that you take two improperly cut cards and place them side by side. Now, let's turn one of the cards 180 degrees while leaving the other one the same. If the cards had been properly cut you would not be able to tell the difference between the two cards. If the cards have been improperly cut, you will see a difference. Now, let's say that you are playing Punto Banco with improperly cut cards, which is what Phil Ivey and his associate were doing. So, Ivey and his associate would request that the important cards in Punto Banco be turned 180 degrees. Let's say that Ivey turned over all of the 7,8,9 cards in the deck 180 degrees while leaving the others the same. This would mean that Ivey and his associate would know if a card was a Seven, Eight or Nine without them being flipped over. This would give them a decided advantage over the casino. The use of an automatic shuffler is key because the automatic shuffler won't flip the cards around as a human dealer would. This is why Ivey and his associate requested an automatic shuffler be used. Now, is "edge sorting" cheating? Who is culpable in this case? The card maker for making the improperly cut cards? The casino for not properly checking the cards? The player for exploiting the flaw? All three parties? Phil Ivey, for his part, has openly admitted to being an "advantage player" but says that "edge sorting" isn't cheating.